A mental-health initiative begun by a UW–Madison student more than 2½ years ago has now distributed nearly 3,500 lime green bandanas to Badgers while expanding to other campuses in the country. The bandanas are intended to spread awareness of mental-health resources and to prevent suicide. The Bandana Project will distribute bandanas and resource cards on Bascom Hill during Mental Illness Awareness Week Oct. 7-13. Bass, of Verona, Wisconsin, says he lost both an uncle and a friend to suicide while in high school. 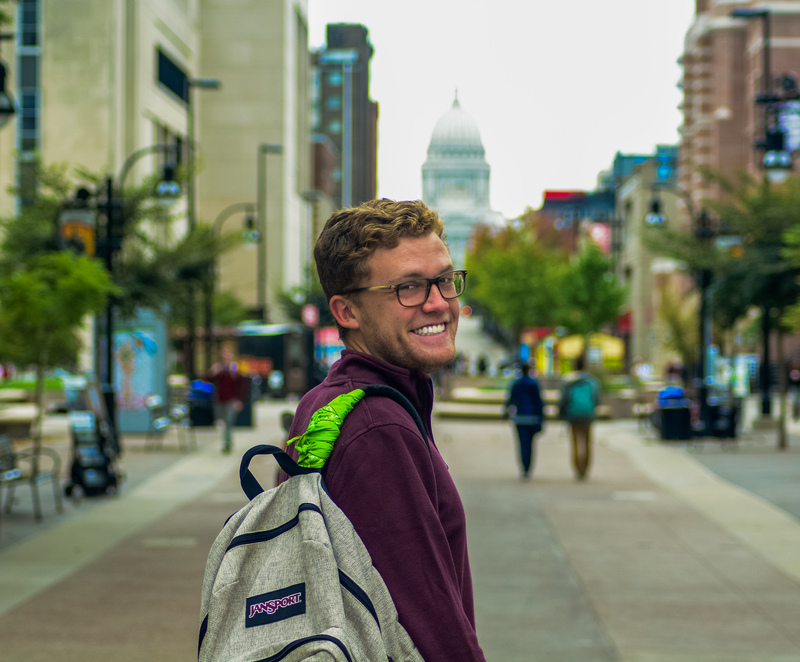 At UW–Madison, he immediately became active in the campus chapter of the National Alliance on Mental Illness (NAMI) and was elected to its executive board as a freshman. With the chapter’s help, he launched The Bandana Project. He got the idea after hearing about students at another college tying pieces of white cloth or white ribbons to their backpacks to show solidarity with an instructor who’d lost a child to suicide. Bass thought the idea could be expanded for a broader suicide-prevention effort. The vibrant lime green color has emerged as the national color of mental health awareness. Students who participate are given a primer on campus mental-health resources and agree to carry resource cards with them. University Health Services (UHS) and the UW–Madison Police Department have partnered with the project, providing staff time and other support. A lime green bandana on a backpack indicates that the student is a safe and knowledgeable individual to approach about mental health-related issues. It also signals invaluable, unspoken solidarity, says Valerie Donovan, UHS suicide prevention & mental health promotion coordinator. As the project grows, Bass is attempting to determine more concretely its impact. In surveying about 3,000 bandana carriers, he learned that 8 percent, or 240 participants, had been asked at least once for a mental health resource card. “That was really exciting for us to find out that bandana carriers are becoming known for having resource cards on them,” he says. While 8 percent might seem small to some people, that’s still a significant number of students who’ve been directly reached through the project, he says. Last spring, Bass and others gave a presentation on the project at the NAMI state conference. Through efforts like that, word has spread. Four other campuses now have full-fledged efforts: the University of Minnesota; Iowa State University; Minnesota State University Mankato; and Itasca Community College (Grand Rapids, Minnesota). Another 10 or so campuses have expressed interest or are in various stages of launching efforts, Bass says. Bass will graduate this December with a bachelor’s degree in neurobiology and a certificate in classical studies. He will turn over leadership of the effort to other students in the NAMI campus chapter, which has agreed to continue the project. Bass plans to pursue a master’s degree in public health, a decision directly linked to his advocacy work on campus. Few families are untouched by mental illness, he says. Despite the heaviness of the topic, being able to discuss it openly with so many other students has proven an unexpected benefit of The Bandana Project, he says. For more information about The Bandana Project, including how to donate, go to namiuw.org. University Health Services offers no-cost, confidential mental health services for UW–Madison students, including a 24-hour crisis line at 608-265-5600 (option 9). UHS also offers third-party consultation for anyone who is concerned about a student. Non-students can call the National Suicide Prevention Lifeline at 800-273-8255.